The most valuable advice I have ever received from an art teacher was: "Paint until you are happy." Most profound thing that have affected my art in a deep way and always pushed me to discover how can an artwork be brought to the next level. I took this advice as my most valuable tool that I have applied into every artwork I created in the last 5 years. Little did I know that at times this advice would become a nagging thing in my head that would not let me rest until an artwork is brought onto a more complex and intriguing state. 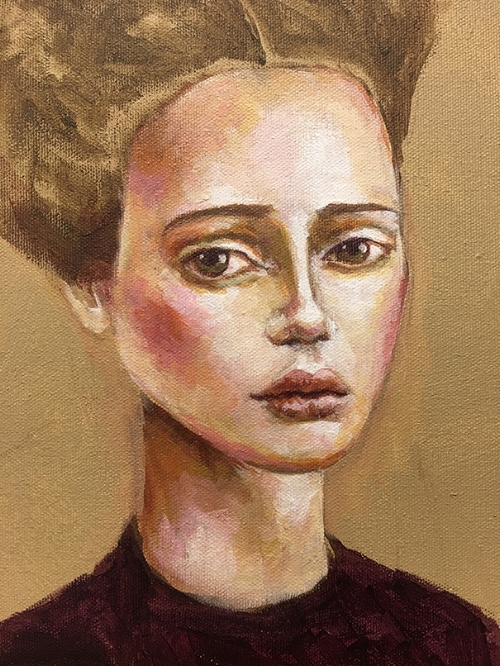 Sometimes I would be stuck at an artwork for weeks, painting and repainting it obsessively, and when not painting I would go around house grumpy and dissatisfied, pondering and guessing, what if and how to? In the last several months the need to change have become my torment and obsession. I discard everything I attempt to paint in the old way and constantly question whether this complete work can be brought to the next level. I call it a love-hate relationship with the canvas. 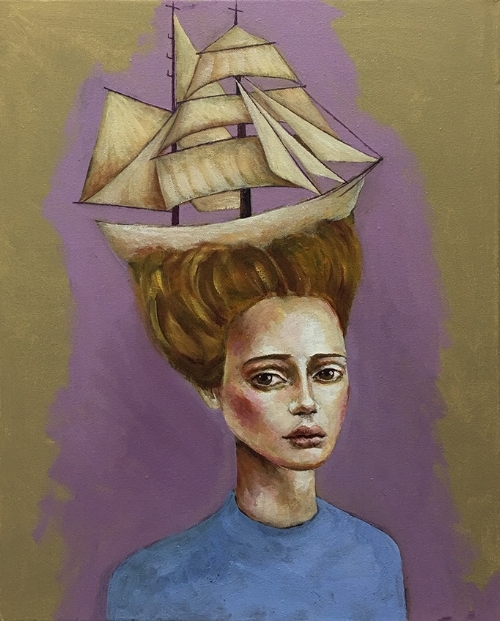 My recent work "Set sail and love" was one of those I struggle with the most. It all started with my usual 15 min Pinterest browsing before bedtime. I came across a photo of a beautiful ship, my mind immediately went on an adventure, imagining incorporating something like this into my art and the name "Set Sail and Love" have jumped to mind right away. I wrote the name down, went to sleep and next morning started working out a composition. First thing I always do is paint a face. That's usually the easiest part. 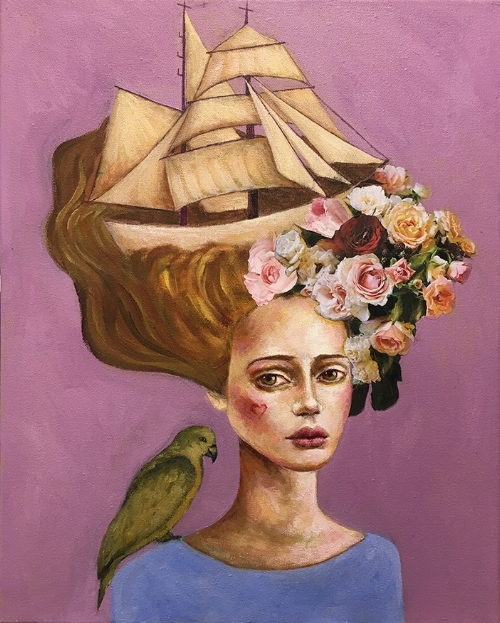 Then I painted a ship and glued collage of flowers that I completely overpainted in my own way. Great thing about acrylics is that it can never be too many layers on the artwork. You can continue adding layers again and again, literally until you are happy. In fact the more layers you add, the better the artwork will be in the end. In this case the more I added, the more I resented this work. It felt stagnant and lack in energy. And the worst thought that I completely hate coming to my mind kept arriving and nagging me: "the whole story lacks in meaning and confusing, it's just a pretty artwork in rococo style." Truly, the last thing I want to make is simply pretty art. To make matters worse, my husband walked into my studio and remarked: "Very nice. Reminds me of your earlier work." My husband is often my worst critique, who pushes me onto another level. Perhaps he did not mean it this time, but I got totally depressed over his comment and almost trashed the whole thing in a bin. But wait, before you ever trash your artwork, just put another layer on it! Paint until you are happy - came to mind. And so I did. I think it's that tension between how i am used to paint story art and how my heart wants to evolve into painting it differently. That struggle to evolve pushes us artists to go for drastic wipe out and repaint, sometimes several times. I cannot say that I am madly in love with the result, but at least I am much happier with her now than in any other stages. I hope you like my Christmas gift, I have filmed and edited a 25 minute video tutorial on how I painted this painting (see full painting picture below). I wish you a wonderful holiday and family time, or alone creative time (which is also awesome), however you choose to make your December exciting - I wish you all the best in that. If you have time to paint with me, please do, this project requires about 2 hours of your time. :) Please tag me on Facebook is you would like me to see what you have created. "Dragonfly Mirror" 13"x17" mixed media on paper. This original is available. Please inquire. This is to receive occasional news on upcoming online workshops or free video tutorials. I have some wonderful & exciting news! Tamara Laporte from Willowing Arts has written a book! 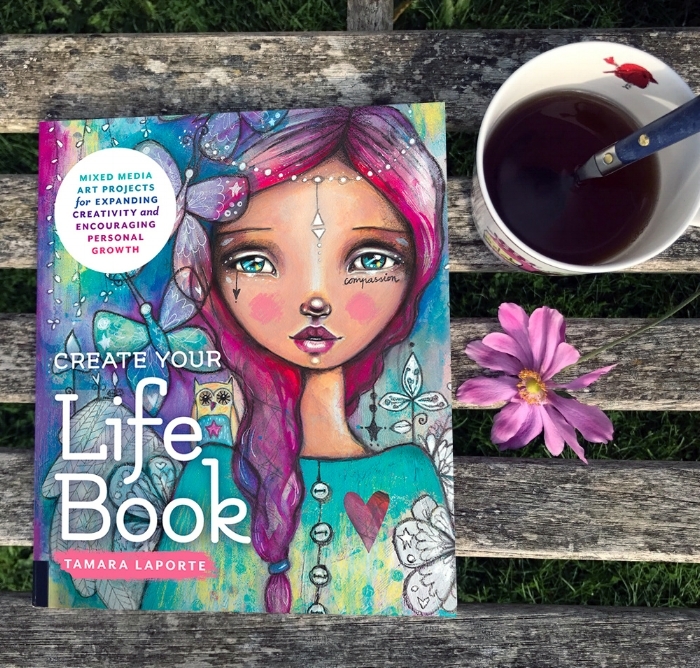 It's called 'Create Your Life Book: Mixed-Media Art Projects for Expanding Creativity and Encouraging Personal Growth' and I get to give away a copy! Each themed chapter presents 4 or 5 two-part projects: The first part of each project explores a common issue that hampers creativity and/or positive self-worth, and includes a worksheet or list of questions to be answered; the second part is a step-by-step mixed-media art project that provides a way for artists at all skill levels to contemplate and work through that issue. 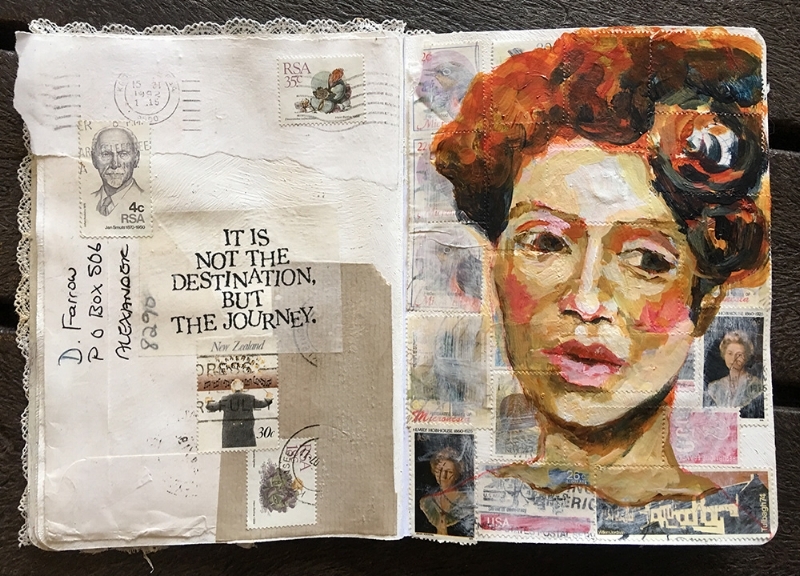 Also included are projects contributed by some of Tamara’s Life Book guest teachers--Roxanne Coble, Andrea Gomoll, Alena Hennessy, Mystele Kirkeeng, Ivy Newport, and Effy Wild--who are noted mixed-media artists in their own right. Along the way, Tamara shares inspirational photos and uplifting and encouraging affirmations. The final chapter presents a simple binding method for creating a keepsake book of your Life Book projects. I will not send you spam. This is for occasional news only. I will announce the winner on 20th December here in this post! 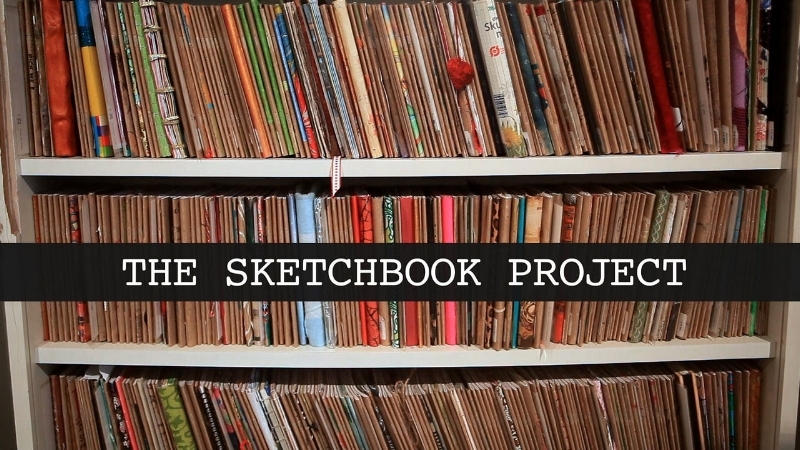 The Brooklyn Art Library consists not of books, but sketchbooks from artists around the world. Anyone can participate, fill the sketchbook with art and post it to the library. So I got a sketchbook from them, and slowly filling it page by page. I find it fascinating to imagine that complete strangers to me would walk into the library and page through my art journal. How I wish one day to visit that library myself! I would easily spend several days there just sitting and enjoying original art of other creative souls. It’s not the same as working into museum to see masters and not allowing to touch anything. Tactile experience of the Brooklyn Art Library must be truly incredible. For this little book I decided to use my collection of postal stamps as base for collages and then paint faces on top. Below just a few pages that I am still working on or have completed so far. Few of them already have collage down, waiting for the face to emerge. The cover is made with gesso, vintage doilies and laces, postal stamps, insides of envelope and stencils. 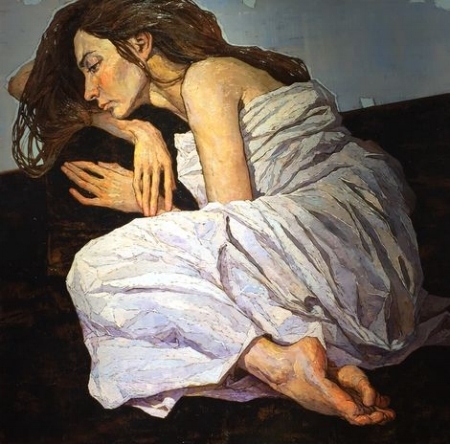 Today I am excited to feature modern Ukrainian artist Denis Sarazhin. I love the soulful and feminine feel of his work, as well as unique recognizable style. 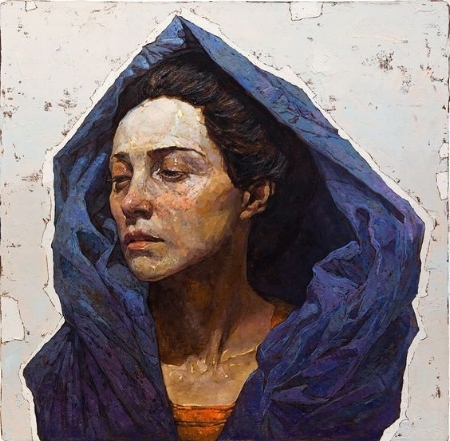 He works mainly with oils, often repeats his chosen color palette and makes very distinctive marks. His subject matter, composition and angles that he chooses are often unconventional yet very effective. He often brakes compositional rules and still makes it work, which in itself already make him a master of his craft.